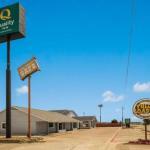 Located just off Interstate 45 this motel is midway between Houston and Dallas in Madisonville and offers an outdoor pool and comfortable guest rooms with free WiFi. A cable TV with HBO is included in every room at Madisonville Inn. Each room is equipped with a microwave refrigerator and tea and coffee making facilities. A business centre and a guest launderette are also on site at Madisonville Inn. Free coffee is available to guests. Fort Boggy State Park is less than 20 minutesâ?? drive from the motel. Madison County Museum is 2 miles away.